Could not get the diode to work. So, I found the FRM01 User Manual on line and opted for function two - ON when power applied for XXXX seconds and OFF when zero is reached. Power OFF the siding and power it ON and all is right with the world! I installed, operated, and managed computer systems for 36 years but never delved very deeply into the electronic level for much other than configuring an I/O board or device with DIP switches. This is a different level of programming but the same principles as programming in Fortran. I know that the module costs more but it provides a lot of flexibility. I'm sure we could work out the diode method, but if you have something that works for you then life is good! The FRM01, at less than $5 shipped, is an incredibly versatile timer-relay module with many applications in O-gauge. 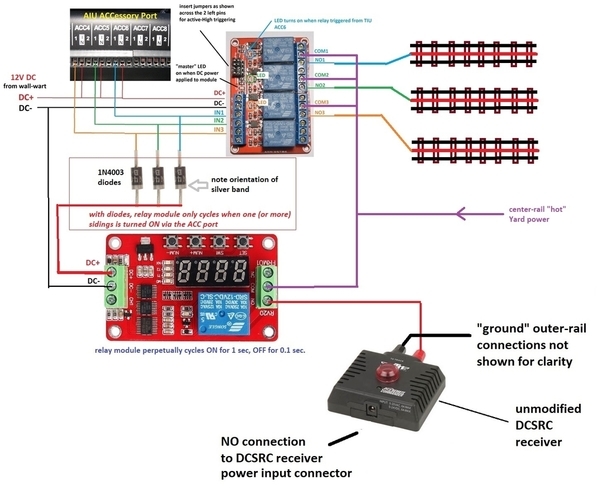 Once you settle on a method to silence engines on newly powered siding/loop, you can then choose to save a few bucks with a single-purpose timer-relay module rather than the multi-purpose FRM01 module. Sounds like George really needs a couple of the A&T Perpetual Barking Watchdog boards to equip a couple of DCSRC units. Agreed. 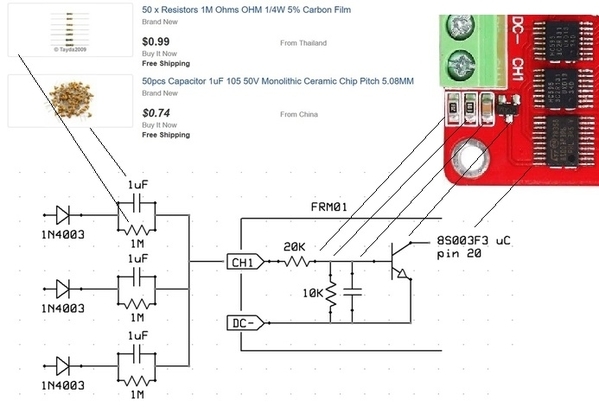 BUT I believe procuring a resistor here, a capacitor there, messing with bare circuit-boards, soldering, testing, etc. can be a hurdle for a lot of guys. Soooo...here's my latest hare-brained scheme. 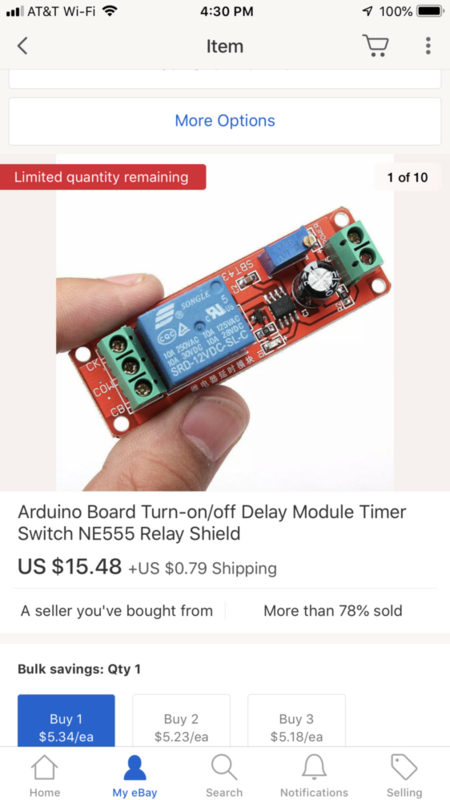 This uses $2 (free shipping from Asia) eBay "Delay-OFF" relay modules. 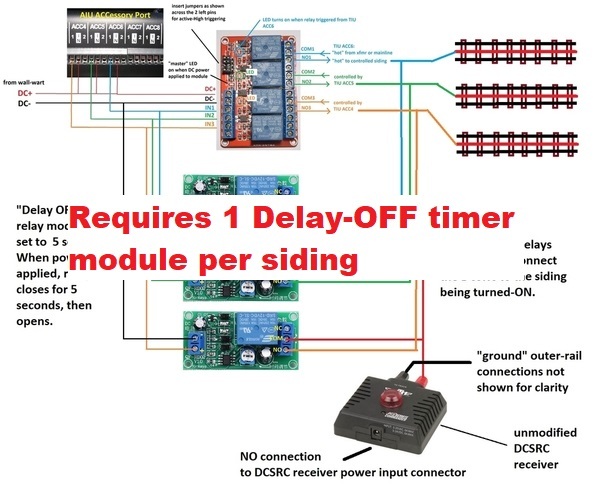 You need one Delay-OFF relay module per siding. But one unmodified (stock) DCSRC receiver can serve multiple sidings. Here's the idea. A Delay-OFF relay module turns on for some fixed settable period, then it turns OFF. So when power is applied to a particular siding using the existing external relay module, a paired Delay-OFF relay also turns on for, say, 5 seconds. The Delay-OFF relay module momentarily (for 5 seconds or whatever) attaches the DCSRC to the newly powered siding. The DCSRC generates its "watchdog" signal to the newly powered siding. The Delay-OFF relay module then turns off (after 5 seconds)...but track power is still applied to the siding since the main power relay is still ON as controlled by the ACC port. So after 5 seconds, the DCSRC is disconnected and turned OFF. This means the DCSRC is ready to be paired to an additional siding that gets powered ON. 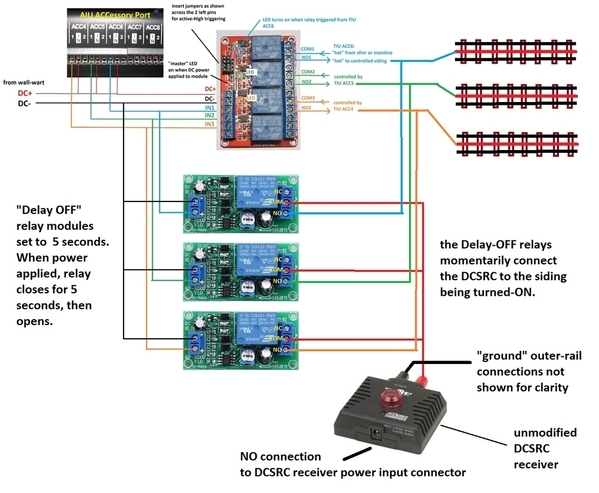 Thus, one DCSRC can service multiple sidings...AND multiple sidings can be active! I realize this is all getting somewhat convoluted but this is a discussion forum to share ideas. I reworked the siding actuator per your previous diagram. It works perfectly! Thank you! I would like to reduce the size but I not sure where to start. The biggest space wasters are the terminal blocks. Do you ever wonder why no one sells these? George, you sure have a point in regard to the terminal blocks hogging up the space. I wish I had seen the ones you used as they are definitely smaller than the version I used. On the plus side, there a lot easier to work with. George, you sure have a point in regard to the terminal blocks hogging up the space. I wish I had seen the ones you used as they are definitely than the version I used. On the plus side, there a lot easier to work with. I found those on eBay but I don’t remember whose they are. What type of wire are you using? I used 18 gauge thermostat wire which is a bit hard to work with. Are you using these to power sidings or ?????? That is the setup for the roundhouse and whiskers around my turntable. I initially was powering my turntable with two on the relays but didn't like how it was working. Back to the drawing board for that solution. I just noticed something about the FRM01 relay board that I’m using to power up my two sidings. When I activate the first siding, the DCS signal generator lights and the siding powers up with the engine silent. The FRM01 displays 02 (function) and it does it power off. When I activate the second siding, the FRM01 program does not run and the signal generator does not fire. Any ideas about what I did wrong? Since the FRM01 has screw-terminals, swap the two FRM01 modules and see if the problem follows the FRM01 or stays with the siding. If that doesn't reveal anything, let us know exactly what your current configuration is. I was reviewing earlier posts in this thread and there have been so many variations that I'm lost as to exactly which setup you now have! A photo might be useful. There are two sidings. When I start one, the engine on that track remains dormant. When I start the second siding, the engine powers up. If I shut them off and reverse the startup order, the second one powers up. So, I don’t think that moving the wires would make a difference. OK, I misunderstood. I thought you had 2 FRM01's (one per siding). To be clear, are those diodes shown in the yellow boxes under the black heat shrink? And they are oriented with the white or silver stripe/band on the bottom side as illustrated? I believe the FRM01 has a power-on LED that lights whenever power is applied...and a different relay-on LED that turns on when the relay clicks on. I assume that once you turn on the first siding (whether it be siding A or siding B), the FRM01 power-on LED turns on and stays on even after the relay clicks on then off. Right? In other words, the FRM01 is performing the Delay-OFF function once and only once for the first siding. Then the FRM01 is now on and does not "re-trigger" its Delay-OFF function for the second (third, fourth, etc.) siding. This is the classic re-trigger conundrum. 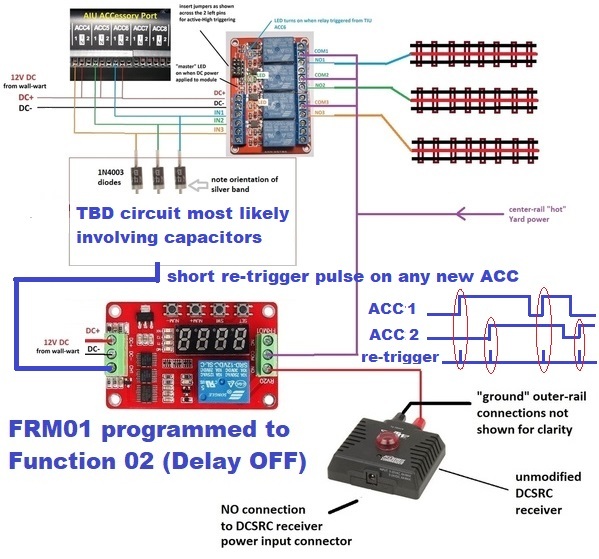 As shown in this earlier diagram, if using the FRM01 "Function 02", there is one timer module PER SIDING. So in your 2 siding test setup, that would be 2 FRM01's set to Function 02. No, just one FRM01. The original schematic showed just one. And yes, the “relay on” LED remains lit after the first use. I’m fairly certain that the diodes are pointed in the correct direction. I can meter them to verify that. I am hoping that this is what I need. I was also hoping that there is a function in the FRM01 that would turn off the FRM01 once the program finished running. In other words, I hoped that one FRM01 could service multiple sidings. No stash of capacitors, but I can always get some. 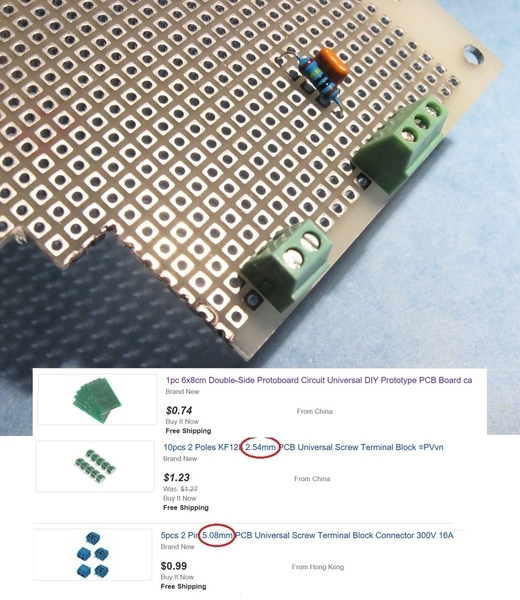 But aren't those the same relays as you proposed in this earlier post? 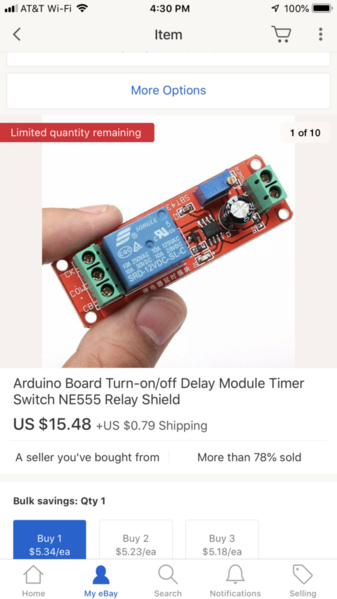 In my response to that post I warn that they are NOT "Delay OFF" modules despite whatever the item description says. They are "Delay ON" modules which is not what you want. Again you want a Delay OFF module which works as follows. 1) You apply 12V power to the module, 2) Relay immediately turns on, 3) after some settable delay such as 5 seconds, the relay turns off and stays off even though 12V power is still applied. To trigger the relay again, remove 12V power and go to step 1). The FRM01 programmed to Function 02 is behaving as a Delay OFF module. As you confirmed, after it performs its delay-OFF once, you cannot re-trigger it unless you remove 12V power and start again. I show an example of a true Delay-OFF module in my recent posts. They are less than $2 on eBay (free shipping from Asia). I'm sure they are also on Amazon too with a suitable markup if being shipped from within US. Or, you can use 1 FRM01 per siding. One might argue that 10 x $2 = $20 for a pile of Delay-OFF modules would let you be done with it and move on, albeit with some assembly/wiring handiwork. I asked about capacitors because the FRM01 Function 02 has an interesting feature which allows you to re-trigger the delay on that 3rd "unused" screw-terminal input. 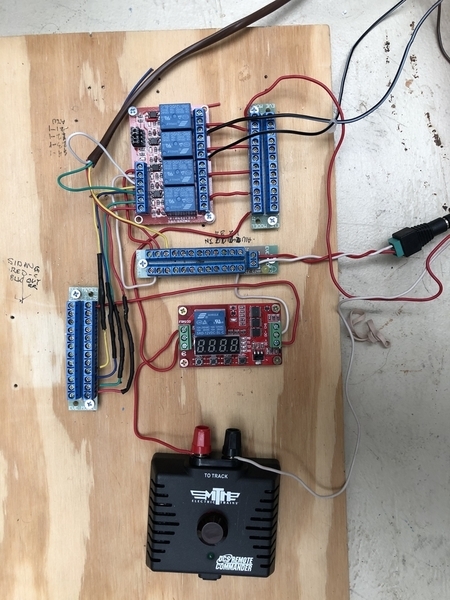 I'd have to mess with it, but there may be a way to use 1 capacitor per siding to re-trigger the FRM01 Function 02 whenever a new siding is turned on even if one or more sidings have already been turned on. Thanks Stan. I was misled by the description. I’ll order the other modules. Can you tell that I don’t know much about electronic components? Stan, I think that I may be on to something. I learned that applying DC+ to CH1 on the FRM01, it forces the FRM01 to rerun the program. The wires from the accessory ports of the AIU go to IN1 to 4 on the track power relay board. If I run a wire from each of those to the CH1 port on the FRM01, won’t that force the wake up signal to go to the intended track? Turning on one or more ACC ports triggers the FRM01 to generate one DELAY-OFF cycle to the DCSRC. Once an ACC port is turned on, the FRM01 has already done its deed and is sitting with power applied but idle. Turning on additional ACC ports has no effect. This is as expected. But as you discovered, Function 02 support re-triggering using the CH1 port. This is shown in the revised diagram above. If you simply run the common wire after the diodes into the CH1 trigger port, you will get a trigger for the first siding turned on. But now the signal is "ON" as long as that siding is powered. Turning on additional ACC ports has no effect since CH1 is already "ON". Hence, in earlier posts I asked about your stash of capacitors. One could devise what should be an inexpensive circuit (likely involving capacitors) that would generate a momentary pulse to trigger the CH1 port whenever an ACC port turns on, even if another ACC port is already on. This is shown in the crude timing diagram. It shows ACC1 turning on which generates a trigger. Then ACC2 turns on which generates another trigger (even though ACC1 already on). ACC1 turns off but no trigger. ACC1 turns on again and generates a trigger (even through ACC2 already ON). Etc. It's not that the capacitor circuit would be expensive - maybe $1-$2 out-of-pocket to allow 5 or 10 sidings to share a single FRM01. It's just that now you have "loose" components ( capacitors, resistors, whatever) hanging about. Hence using $2 Delay-OFF modules, albeit one per siding, seemed more straightforward. But I suppose a determined DIY'er who knows which end of a soldering iron to hold could argue it would be a more compact solution, save a few bucks, and maybe have some fun fiddling with electronics along the way. I suspect in the cost saving category, there is undoubtedly a triggerable DELAY-OFF module that is less expensive than the FRM01. If this is something you'd like to pursue I can poke around an FRM01 to see what kind of CH1-trigger signal it needs and probably concoct an inexpensive and easy-to-assemble circuit to use the Function 02 re-trigger capability. Stan, thank you for the input. Since the additional relays are on their way, that’s the direction that I’ll take. Just thought that I might have stumbled onto a way to stay with the FRM01. Life is good! I hear you. Changing horses mid-stream can be fraught with peril. At less than $5 shipped, the FRM01 is a gift that keeps on giving! I continually find new O-gauge applications for it. Stan, I cannot seen to be able to find the right relays. I have some NE555 relays that can power off a device or power it on, depending how I connect the wires to the board. I cant seem to be able to get them correctly wired into the siding system. I’ve torn it apart and am starting over again from scratch. If we're talking about the one relay module PER siding method, this requires a DELAY-OFF module. As mentioned previously, some of the relay modules online are not-as-described. Above show some modules that will work. The more expensive multi-function timers can perform more tricks. 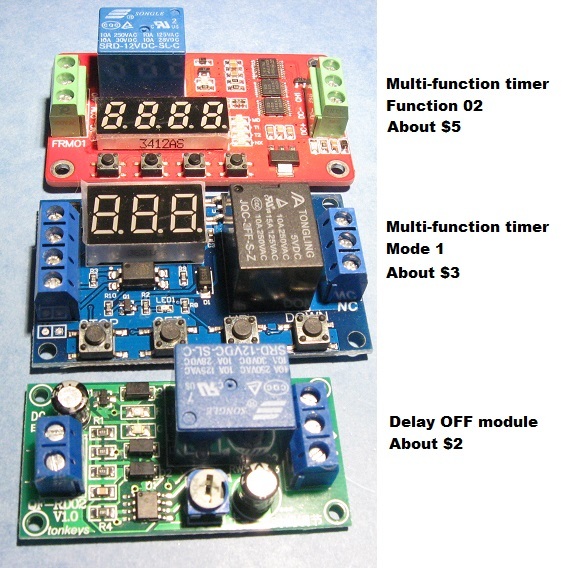 The two on top require a one-time "programming" to select the mode to Delay-off and to set the timing parameters. The one on the bottom "only" performs the delay-off function and you simply turn the adjustment control to set the delay time; one of my earlier posts shows an ebay listing and I'd think the item description would be the same if you prefer Amazon or similar US distributor. As I understand it, you may have some delay modules (that use the NE555 IC chip) but they are NOT of the Delay-OFF type. As is often the case, there are ways to hack them to change functionality but really not worth the effort when you can get exactly what you want for just a couple bucks. Here is the simplified illustration that Stan was kind enough to supply us and the basis for the panel I put together in the picture I posted above. Only thing different for me was the second batch of latching relays I received from our Asian friends used a negative trigger instead so I had to flip the diodes and switch the lead from the FRM01 and use the negative side. Thanks again Stan. The top one is the FRM01 that I started all this with. I was able to get one of the NE555 boards to turn on power to the siding and simultaneously activate the DSC signal. But, it created other problems that I haven’t tracked down. The bottom line is that the NE555 board remains powered on until I turn off the siding. Which isn’t a bad thing. When you say "remains powered on" do you mean the RELAY on the board remains powered on? 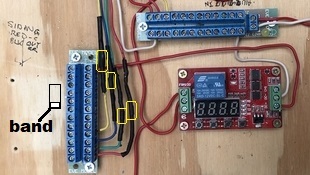 When a new siding turns on, the RELAY on the NE555 board should only turn on for a few seconds and then click off and remain off even if the NE555 board itself remains powered on. This is critical to the operation of this method. The DCSRC must turn on for only a few seconds when any new siding is powered up. The DCSRC must then turn off until another siding is powered on. This is because the DCSRC only generates the magic watchdog signal when it initially received power. And of course the above only applies to the current method under discussion which uses a "stock" unmodified DCSRC. If using the modified DCSRC (a.k.a. 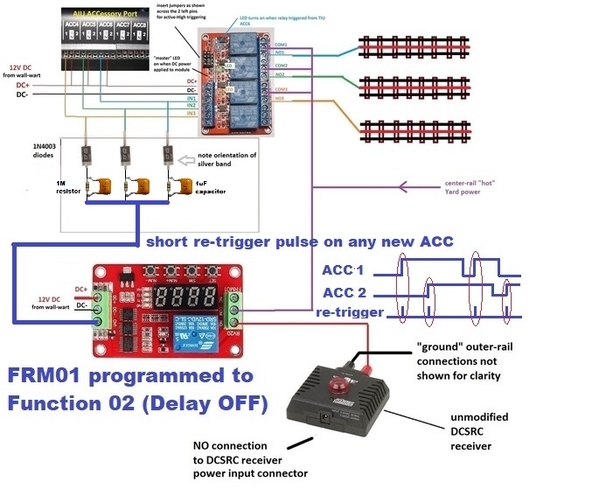 Perpetual Barking Watchdog) or a FRM01-like timer programmed to continuously cycle power on and off to a stock DCSRC, you do not need to mess with the Delay-OFF timer relay modules. Only thing different for me was the second batch of latching relays I received from our Asian friends used a negative trigger instead so I had to flip the diodes and switch the lead from the FRM01 and use the negative side. 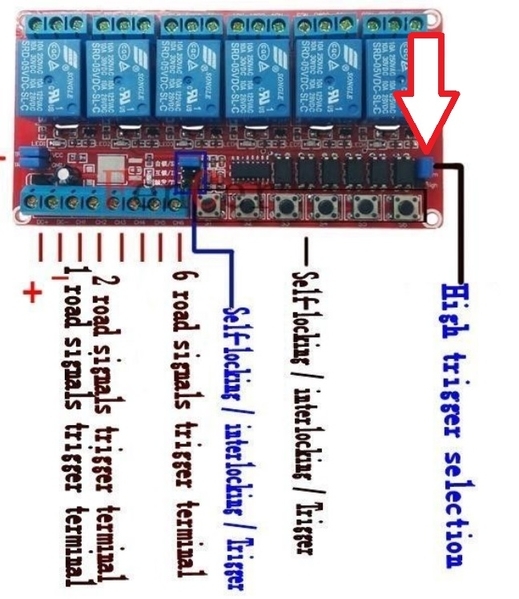 So there is a version of the 6-latching-relay module that looks like the above but does NOT come with the jumper-plug that allows you to select high vs. low trigger? I suppose only offering one polarity of triggering could save a tad (a small tad) in component costs. The first and second batch of relays look identical, jumper selection and all, save the led that shows there powered up (green vs red). However, when I wired up the second batch (all the jumpers in the same location) they wouldn't work with 12+. I thought I had some bad boards until I tried 12- and they worked, go figure. Sir, I have mine wired as above. I am using program 02 on the FRM01. When turning on the first siding, it goes through it’s program and remains on. Powering on the second siding does not cause it to rerun the program. The only thing that will do that is the application of DC+ to post CH1 on the FRM01. I cannot determine what I have done wrong. George, here's a couple of things that may be of help. It sure helped me. As long as one or more sidings is active, the FRM01 will be clicking on-off-on-off-etc. about once per second. It was this perpetual mechanical clicking that I thought was annoying and hence suggested the one timer relay module per siding...so you'd only get a single click when a new siding was powered. So if your setup is wired exactly as shown above (with the diodes installed), you should be able to set the FRM01 to Function 06 with T1=1.0 sec on, T2=0.1 sec off and your 2 siding test set up should work. But to be clear, whenever one or both sidings are on, the FRM01 will be clicking. If neither siding is powered, the FRM01 is dark and silent. Yep! It’s annoying. It’s a shame that I can’t take advantage of the CH1 to get it to recycle on program 02. Thanks. Curiosity got the better of me so I extracted the CH1 trigger input circuit of the FRM01. 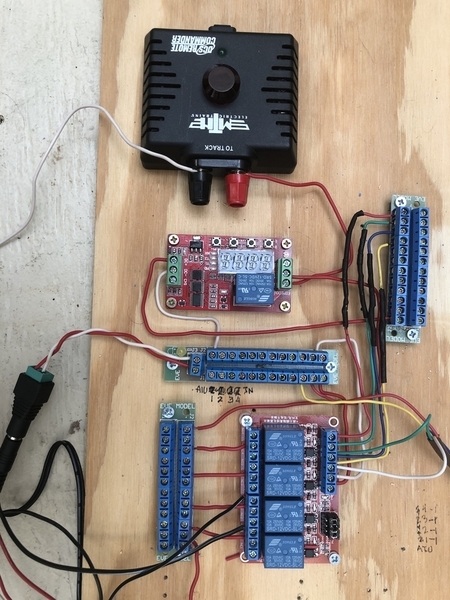 Here's one way to take advantage of CH1 and the FRM01 Function 02 so that a single FRM01 can handle multiple sidings using an unmodified (stock) DCS Remote Commander to supply the watchdog signal. Following each 1N4003 diode, insert 3 cents of parts (a 1M resistor and a 1uF capacitor) as shown. To be clear, I do not recommend this since it means messing with loose components and soldering. I present this for the record as I can imagine other AIU applications where multiple ACC(essory) ports can trigger a single FRM01 to perform some kind of timing/delay function for layout accessories. Right now, I have it working. The constant clicking gets a bit old, but at least it’s functioning. I may try another set up with this design and see how I like it. What do you recommend as a board to build these on? Is there a perforated soldering medium to build it on? I'd say the most popular "perforated soldering medium" is the prototype PCB. They are pre-drilled with solder rings on a 0.1" (2.54mm) grid. Pretty much all are 1/16" (1.6mm) thick and cuttable with a hobby/hack saw. There are even screw-terminal connectors that fit this grid - 0.1" (2.54mm) shown in photo in 2-pole and 3-pole. Though I must say 0.1" screw-terminal blocks are quite tiny to work with in which case there are 0.2" screw-terminal blocks that drop in skipping a hole. On eBay use 2.54mm or 5.08mm in search. Wire terminals on resistors and capacitors are a couple inches on each side. So since this is such a "simple" circuit you can probably use the wire terminals themselves to make all the interconnections in a point-to-point fashion. In other words, you shouldn't have to cut and strip short lengths of insulated wiring to make the interconnections on the "bottom" of the board. Cool! On to the finished project! I’m learning enough to be dangerous! Thank you, Stan! How does this look as a parts list? I don't see the capacitors in your basket? If you prefer USA sellers, how about the following. 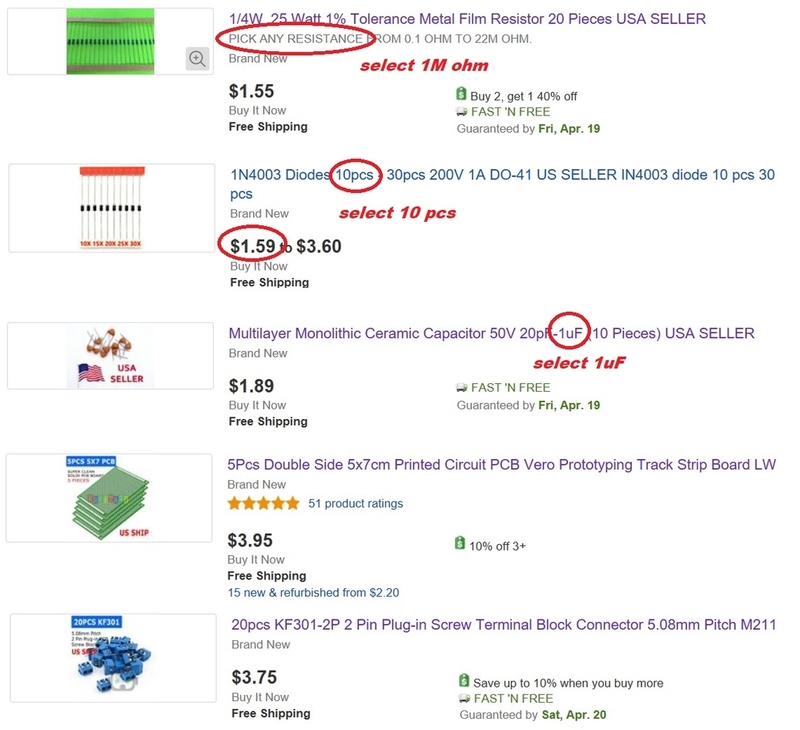 In most cases I found you more parts for less $. I'm not sure the size of the Prototyping board you chose, but the one shown below is more than large enough and much less $. So to be clear, you're undertaking this DIY for fun-and-amusement as part of the hobby? I thought we had settled on a one-per-siding Delay-Off relay module approach (no soldering) and that you had already ordered modules. Did not order them yet. I tried to find suppliers that could get the parts to me in a reasonable amount of time. I’ll use your list of parts. 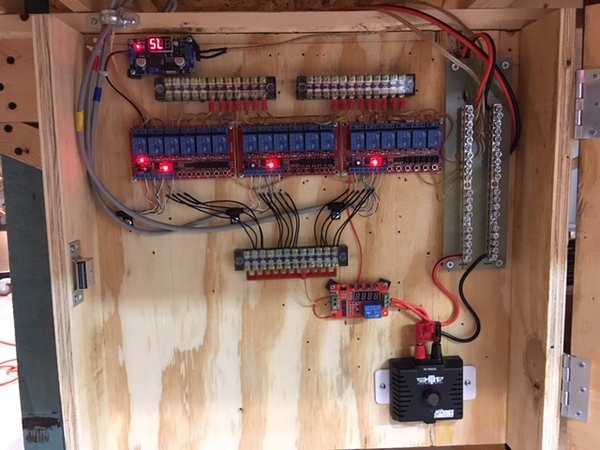 I chose a larger board so that I could mount the FRM01 and the power relay board all together. I’m not planning on using the delay-off relays. I am going to follow this diagram. And yes I’m doing this my enjoyment. And hopefully implement this when I start building a more permanent layout.